Known in the tattoo business as "Circus Leo" because of the years spent traveling with the circus and carnivals, Leo Leopold worked with the Bill Lynch Show, Elliot Walkers World Finest, Wallace Bros. and the Ringling Bros. to name a few. Leo was Tattoo Club of America member #274. In their Winter 1965 newsletter the Tattoo Club of America had this short bio on him. "Leo Leopold got his first tattoo from Charlie Snow in Halifax around the age of 17. This was in the 1930s when he was working as a seaman. With the outbreak of World War II he enlisted in the Royal Canadian Navy where he spent 5 years, adding to his tattoo collection as he traveled. Many of his tattoos were signed by the artists, like Milton Zeis, Davy Jones, Ron Ackers and others. 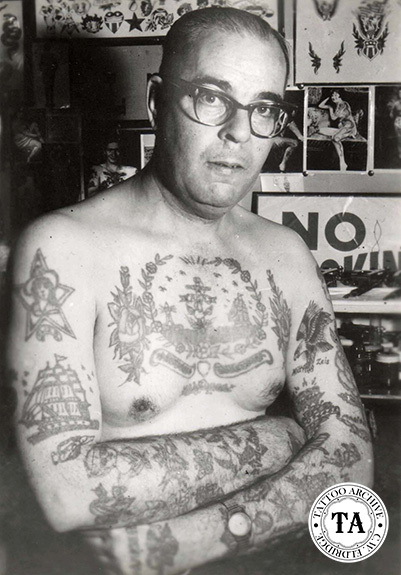 After the war he began to learn more about tattooing and often visited Charlie Wagner in New York City. Wagner taught him a few tricks of the trade and in 1948 with his new Owen Jensen machine, Circus Leo settled into Nanaimo on Vancouver Island and opened his first shop. Ten years later he moved to #536 Robson St. in Vancouver where he worked for many years." Circus Leo was featured along with 19 other international tattooists in Tattoo 70, a publication from Lyle Tuttle's Tattoo Art Museum in San Francisco and can be seen with his wife Irene in Kobel photographs 818 through 820 and 1232, 1289 and 1290.